Going through the fridge is one of those chores I don’t particularly look forward to. While I try to use everything up, some things get tucked away just wrong and are missed, wasted. That’s particularly true with leftovers. 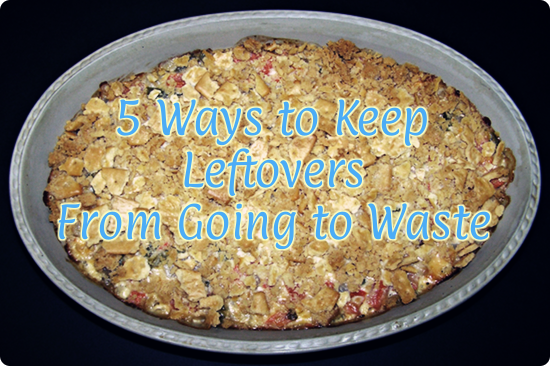 I’ve found a few things that help our family actually use up leftovers a little more often. It doesn’t work all the time, but it helps. 1. Don’t cook so much extra. This can be a little hard to predict, especially if you aren’t sure if the kids are going to like what you made. But the better you can predict what will really be eaten in one meal the fewer leftovers you’ll have to deal with. On the flip side, if you have something your family will love, sometimes leftovers are a good idea. This is especially true if you have the freezer space to store the excess and the food freezes well. Makes a great alternative to prepackaged frozen dinners on those nights that you just don’t feel like cooking. I use leftovers for my lunch. For my daughter’s school lunch. I try to get my husband to take them to work for lunch, but that almost never works. For school lunches you want foods that either go well in a thermos or still taste good cold. Chop up leftover meat into bite-size pieces, add a sauce and some vegetables, and last night’s meat tastes new. When all else fails, skip making dinner one night and just reheat a bunch of leftovers. You have to watch the age of your leftovers, of course, but when you have enough that are good take advantage.